As a commercial firm, the London-based publishers J. M. Dent looked to technologies such as offset lithography to produce colour prints that would greatly enhance their publications. According to one scholar, Michael Sullivan, the earliest known example of colour printing is a two-colour frontispiece to a Buddhist sutra scroll, dated 1346. Thus, this frontispiece in this trade edition of Lagerlöf’s The Wonderful Adventures of Nils is one in a long tradition. It also carries a common feature in modern-day frontispieces: the printing of a small portion of text with a page number that references the image to where it (the action) occurs in the text. 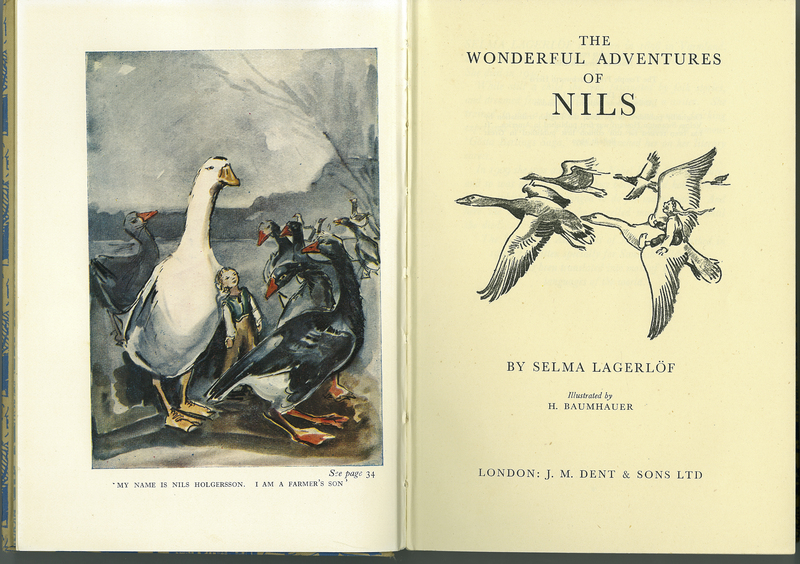 Selma Lagerlöf, “The Wonderful Adventures of Nils,” ourheritage.ac.nz | OUR Heritage, accessed April 24, 2019, http://ourheritage.ac.nz/items/show/10653.